As a teacher, nothing has caused me more of the icky feeling of guilt than formal papers. Guilty that maybe I wasn't assigning them often enough, guilty that maybe I wasn't teaching them well enough, guilty that I wasn't grading them fast enough. The struggle is real. 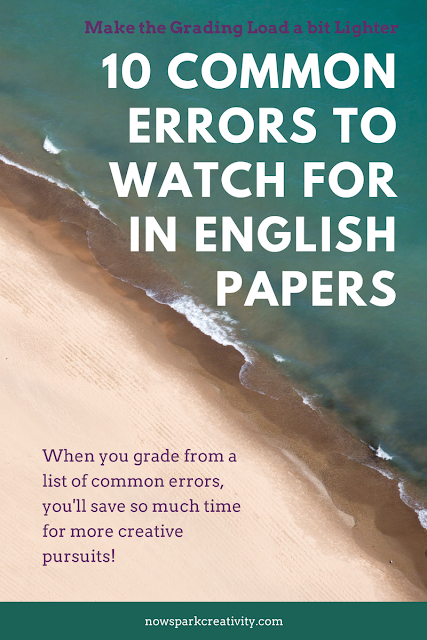 For English teachers, the grading load can be enough to drive us out of the profession. Writing substantive comments on one paper, much less multiple drafts of the same paper, can take thirty minutes. If you collect one hundred and twenty papers on a Friday afternoon, are you supposed to spend sixty hours grading it over the next week? Over time, I began to chip away at my guilt and start to feel good about the way I did formal papers in my classes. I owned the fact that I wanted to teach my students about creative and critical thinking and have them apply it across a range of genres, not just in one style of formal paper. I developed two systems for teaching formal writing that made things very straightforward for me - an introduction blueprint and a very specific way to analyze quotations I called the "Quotation Burger." And though I never became exactly "fast" at grading papers, I did develop a system to be a lot faster. A system I'd like to share with you today. Back in high school I took an A.P. Spanish class, and my Spanish teacher had us all write regularly in journals. Every week she collected all the journals in all her classes. That must have made for quite a weekend of work. The heart trembles. But when she passed them back she always did so with a list she called "Los Errores Del Infierno" (The Erros from Hell!). It was a list of the crop of errors she saw the most often in our journals, so we could learn from that list and hopefully never make them again. So brilliant. I salute you, Señora! I have adapted her system for English papers. 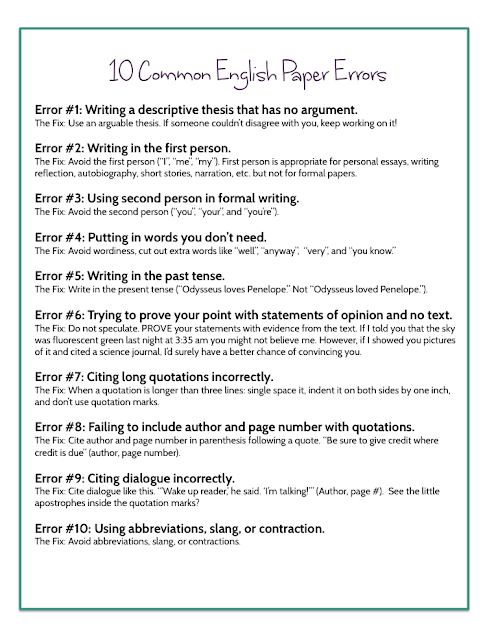 Over time it became clear that a huge amount of the long comments I was writing could be classified into ten common errors. 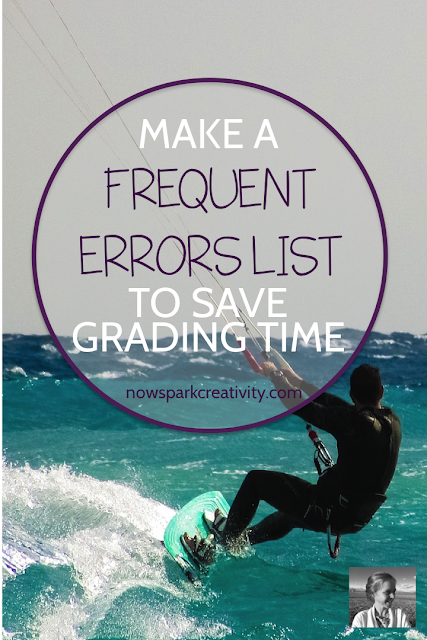 By giving these errors each a number, it was easy to simply put a number in the margin of a paper so that the student could look up the fix they needed for that particular error. If every student has a list of the most common errors as the front page of their binder or glued into their notebook or uploaded to the class website, etc., you can save yourself a GIGANTIC volume of comment writing. Where before you might have written: "This is a true statement but it's not exactly a thesis. Dive deeper, try to find something you can argue with specific evidence from the text to prove your larger point." Instead you can write, "#1." Multiple that by five hundred or so comments and you've saved yourself enough time to train for a marathon! Sure, you'll still need to write comments, but you won't need to repeat the same ones over and over and over. Instead, you'll be able to dive deep into nuance with advanced students and give some extra attention to struggling students. And still save so much time. 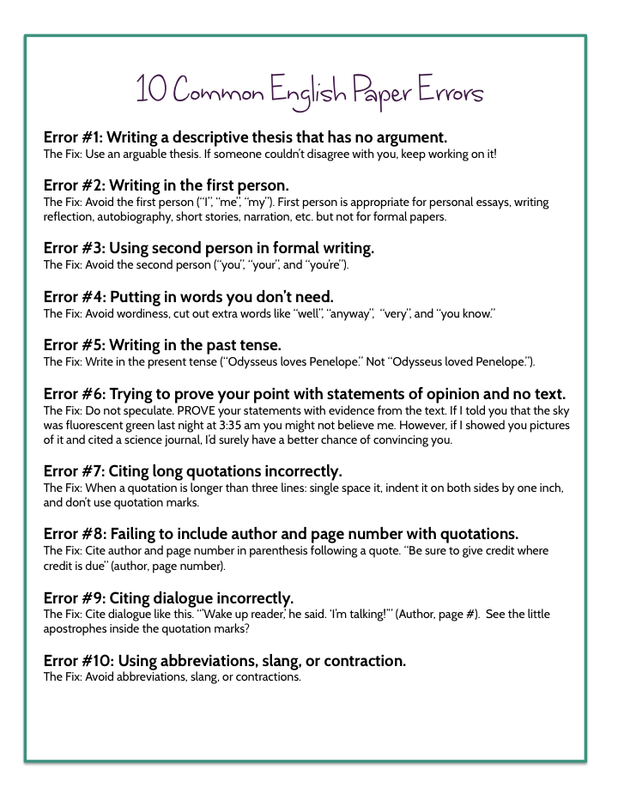 After years of teaching all the high school grades, I can confidently say the ones in the handout above are ten of the most common errors across the board. I'd love to share this PDF with you for your own classroom, so you can start saving your time for more creative pursuits. Just fill out the form below and you'll be on your way.